On Saturday, 28 January, while I was at the Space Coast Birding and Wildlife Festival, Doug Gochfeld and I made our way to central Florida for most of a day’s birding, looking for the specialty species of that region. 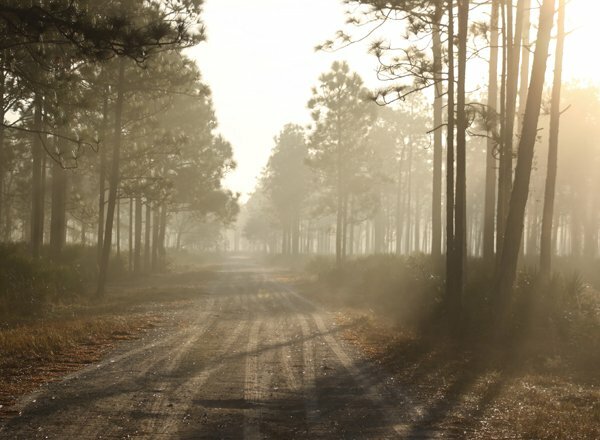 Our first stop, in the early morning, was Three Lakes Wildlife Management Area, south of Kissimmee in the town of Osceola, where we hoped to find the species associated with open stands of Longleaf Pine – namely, Bachmann’s Sparrow and Red-cockaded Woodpecker. 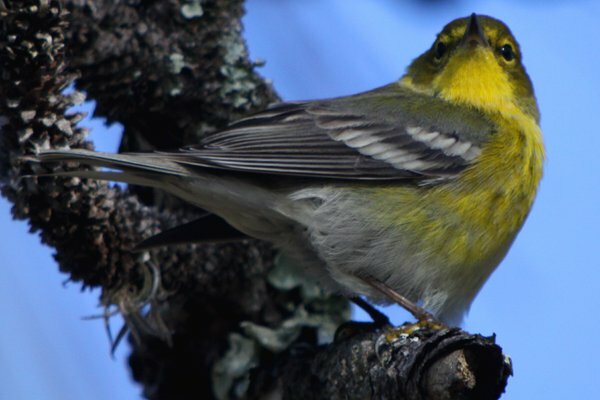 The former would be a lifer and the latter, which I had previously seen courtesy of Nate in North Carolina, is simply a bird that you should always take the time to see. 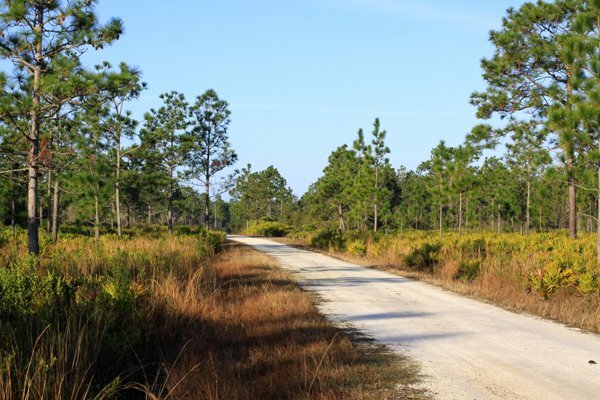 We entered Three Lakes from the east, off of Route 441, and I was pleased to be in the southeastern pine forest again. 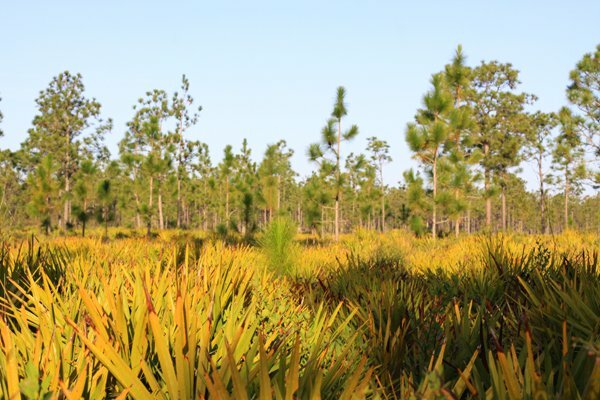 It was interesting to compare the Florida pine forest, which had an extensive understory of Saw Palmetto, to those in North Carolina, which lack palmettos. We drove slowly down the dirt roads listening and watching for birds. A horde of American Robins inhabited the area, and a few Eastern Bluebirds were around as well. 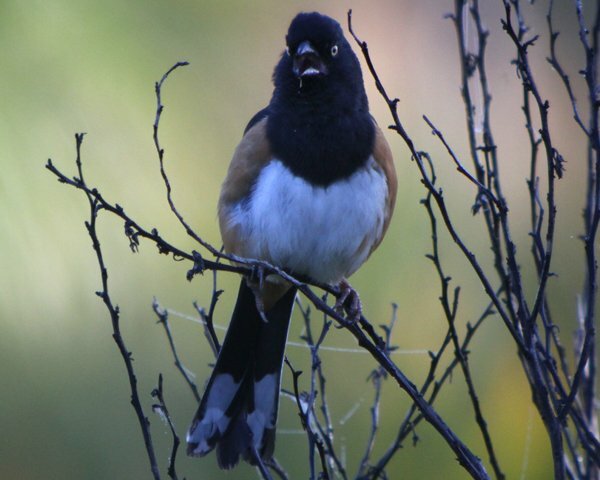 Eastern Towhees – one of the white-eyed subspecies – sang from several places, as did Pine Warblers and Chipping Sparrows. We came up with a system where I would drop Doug off, drive a ways up the road and explore that area while Doug caught up, allowing us to cover more ground. It was on one such solo excursion that I enjoyed the company of a couple of another southeastern specialty, the Brown-headed Nuthatch. 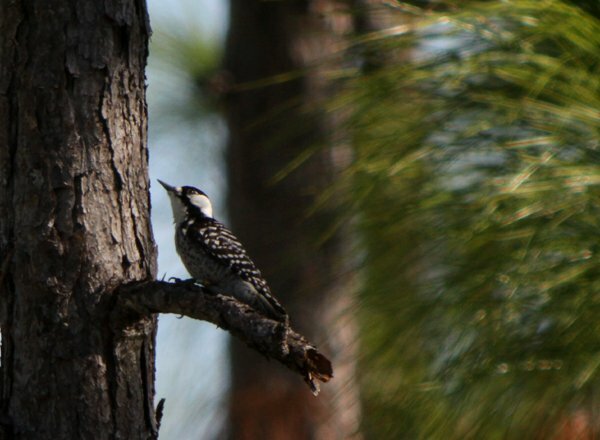 The nuthatches were nice, but they were not the reason we were in the pines. Neither were the Pileated Woodpeckers we found nor the Orange-crowned Warbler. Then I spotted a woodpecker fly from tree to tree about three hundred yards away, got the scope on it, and, yes, Red-cockaded Woodpecker! After a moment of panic and self doubt when I couldn’t get Doug on the bird and instead kept focusing on a Red-bellied Woodpecker, he managed to spot it as well. One target species down, though barely, and one to go! Bachman’s Sparrow was going to be more of a challenge. They are notoriously skulky and are known not to sing much, if at all, in the winter. So you can understand why neither of us were really expecting to hear one sing and why the clear opening note of its song made me think I was hearing an Eastern Meadowlark. Eventually, we realized what we were hearing and managed to get unsatisfying views of the bird when we accidentally flushed it. An attempt to get a better look resulted in a second flush and rather than harass it further we went on our way and let the bird be. Definitely going down in the books as a BVD – better view desired. But we were not quite done with Three Lakes. On our way in the very friendly gatekeeper had let us know about his suet feeder that attracted scads of Pine Warblers and we figured that it would be worth checking out. We had no success at the feeder but did see several Pine Warblers in the vicinity, as well as a pair of Common Ground-Doves. Out to 441 we went and made our way around to Canoe Creek Road, from which we hoped to explore side roads and other portions of Three Lakes WMA in search of more satisfying looks at our target birds. While we had no luck with any further Bachman’s Sparrows we did luck out with some Red-cockaded Woodpeckers when one flew over the car as I sped along. We pulled over and enjoyed a pair of Picoides borealis for about half an hour before going on our way. The best part was watching them interact with some Red-bellied Woodpeckers. 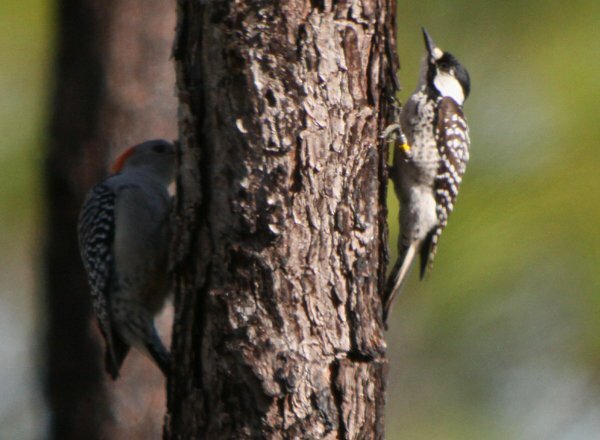 The Red-cockaded Woodpeckers were more than willing to push the red-bellies around! 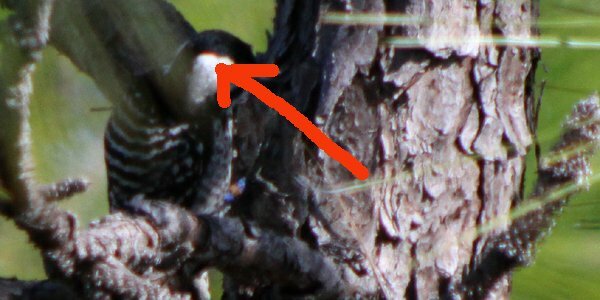 Note the jewelry you can see on the woodpeckers’ legs – these birds are well-studied and part of an intensive management plan to keep them going! But even cooler than the bands is the image I am about to show. An image so mind-blowing that most birders will think it is photoshopped. 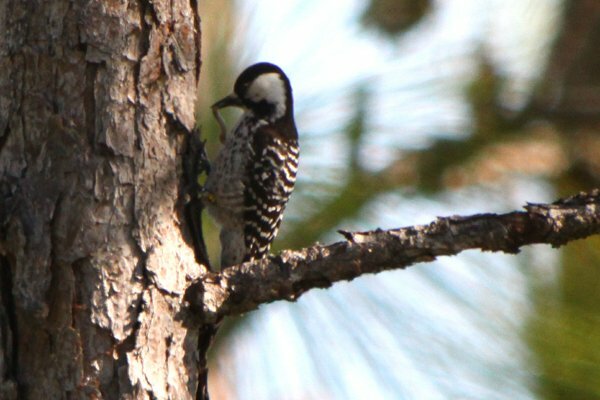 Amazingly, I managed to digiscope the red cockade of the Red-cockaded Woodpecker, an identification feature that is nearly never seen without holding the bird in the hand. I await my accolades and my large cash reward. Stay tuned for parts two and three of me and Doug’s run through central Florida. So is there a reporting system for the colour-ringed birds or is it just for scientist observers? Also those roads look like they’d be magnificiently snakey of an evening. Great photos of the Brown-headed Nuthatch. I’ve never seen one, and really appreciated your photos. @tai haku: They can reported just as regularly banded birds can…I’m going to have to get to it. @Jochen: You pretty much don’t walk through the palmettos because it would be very unpleasant. There are some more open portions where it is more of a grassland beneath the trees that are much nicer. @Wendy: Thanks! You really need to get to the southeast someday and see them. They are quite the little charmers.